Apply now! to be a member of the Cumbria Scouts unit heading to Poland in 2020 for two weeks of adventure, excitement and learning! This email is intended for young people in Cumbria Scouts born between 26th July 2002 and 25th July 2006. Please forward this on to any young people within your Section, Group, Unit or District who are eligible to apply. Thank you. What is a European Jamboree? EuroJam is a large scale international event held for Scouting and Girl Guiding nations in Europe. 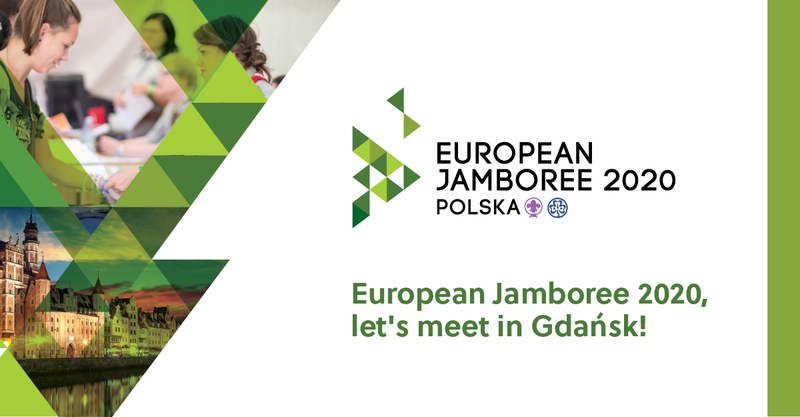 After a gap of nearly 15 years, since the UK hosted the last European Jamboree in 2005, the upcoming European Scout Jamboree will take place in Gdansk, Poland between the 26th July and 6th August 2020. Building on the fantastic programme developed as part of their World Scout Jamboree bids the Scouts and Guides of Poland invite you to join them for 11 days of activities, combining the chance to develop new skills, make new friends from across Europe and experience Poland’s beautiful countryside. Where is EuroJam taking place? The European Jamboree venue is located on Sobieszewo Island in Gdansk, the City of Freedom, on the coast of the Baltic Sea in Northern Poland. The City of Gdansk is a city with a history of more than 1000 years, whose identity has been influenced by various cultures and religions, historical milestones and big events through the ages. Gdansk is also the birthplace of the Solidarity Movement led by a Nobel Peace Prize-winner Lech Wałęsa. Sobieszewo Island is surrounded by the sea and rivers, and a 20-minute drive from the historic centre of Gdansk. The island enjoys the status of an ecological island; its natural features and microclimate make it an ideal place for visiting during summer time. It offers various landscapes: the seaside forest, several kilometres of wide beach, picturesque open fields and farmland. Give an opportunity to experience the amazing adventures on the Sobieszewo campsite. The dates for the event itself are 26th July – 6th August 2020. It is our aim to also hold a post-jamboree experience in Europe after the event, and this is something that the young people will be involved in planning after selection. To allow us flexibility with travel please make sure you are available from 24th July – 11th August 2010. As soon as we are able to book our transport and pre/post event experiences we will update you with confirmed dates. EuroJam 2020 is set to be one of the most flexible jamboree style events yet – with the majority of the decisions about the experience to be decided by each unit. Cumbria Scouts hope to take a full unit of 36 young people and 4 adults to the event and we are already in the process of planning our journey to the event in 2020. If we are unable to fill a full unit we will take either 18 or 27 young people. A large scale jamboree is not for the faint-hearted, it is a BIG experience in anyone’s life – as a Scout / Explorer Scout, as an adult volunteer leader or in the International Service Team. You make a big commitment to yourself, our County, the UK Contingent, the Scout Movement, to those who supported you, and others who might be inspired by what you will experience. You will be expected to attend training, team-building camps, fund-raising and social events in 2019 – 20. A full diary of provisional dates will be sent out before the selection event with more details. The Scout Association and Cumbria Scout County is committed to making participation a possibility for all within the age range. We anticipate that the event itself will cost no more than £1500. This is a significant amount but you should not be put off by this amount. More details regarding cost, payments and fundraising will be sent out before the selection event. Applicants will be invited to attend a selection event at Ennerdale Scout Campsite on either the 5th or 6th January 2019. Please keep both of these dates available as we will not be allocating places until after the application deadline. Applications are open to Cumbrian Scouts or Explorers born between 26th July 2002 and 25th July 2006 – there are absolutely no exceptions to this rule. A deposit of £75 will be required within 7 days if you are successful in your selection. Deadline for all applications is Friday 21st December at 23:59. Copyright © 2018 Cumbria Scouts, All rights reserved.